BRENDEN W. DESMOND, Esq. - Nathan, Dumm & Mayer P.C. Brenden William O’Brien Desmond, Esq. Brenden Desmond is a native of Colorado and a graduate of the University of Denver, Sturm College of Law, where he was Managing Editor of The Denver Journal of International Law and Policy and a member of the Civil Rights Clinic. He was awarded the Governor Love Scholarship for his commitment to public service. Brenden also attended the University of Denver for his undergraduate education in Public Policy and Political Science, earning honors in Political Science for his research on empirically measuring power structures in the international system. He also has a Master’s in Public Administration from New York University’s Robert F. Wagner School of Public Service where he was Editor-in-Chief of The Wagner Review. 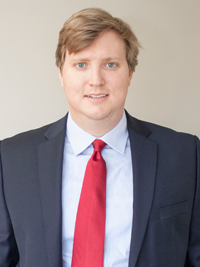 Brenden’s practice includes representing governmental entities in a wide range of matters from civil rights claims to regulatory and employment issues.